Strong opening order book and healthy bid pipeline ensures 15% revenue growth in FY2018 with an improvement in EBITDA Margin. During FY2017 KEC has regained its EBITDA margin in range of 9-11% after six financial years. Management’s continuous focus on the business turnaround of SAE, railway and cable vertical has paid the return in terms of improvement in EBITDA margin. In Q4FY2017, it has clocked 10.4% EBITDA margin which is the highest in last 24 quarters. However, the revenue growth during the same period remained largely flat on account of soft commodity price, demonisation and USD deprecation against INR. SAE business remained sluggish in FY2017 in terms of order inflow especially from Mexico, but in Brazil, the management is witnessing traction and expects spike in performance in late FY2018. 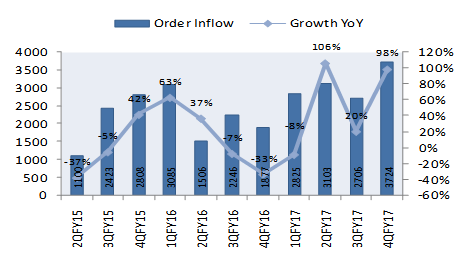 But strong order book at the end of the FY17 and healthy bid pipeline gives us confidence of 12% plus revenue growth in FY18. KEC has secured orders worth of 945 Cr across various businesses verticals as on 19th May 2017. These orders are over and above 12631 Cr of order book. Orders include 560 Cr order from Transmission and distribution, 277 Cr from Civil and 158 Cr worth of order for supplying EHV cables. KEC International has entered into new business vertical “Civil Business”. Where KEC undertake civil EPC works for factories and Plants, medium size residential projects etc. Significant improvement in working capital on account of better AR collection resulted into higher PAT. Management’s continuous approach to drag down receivables days in a range of 180 days will further strengthen the bottom line. We expect 11% and 12% revenue growth in FY18 and FY19 respectively. EPS will grow 10% and 22% in FY18 and FY19 respectively. Currently, the stock is trading at 18.9 x and 15.5x of FY18 and FY19 EPS respectively. Considering the above argument we have a positive stance on the stock and recommend “BUY” with target price 290.